This post is for readers of the novel and other short stories in this universe, mostly collected in The Ladies of Grace Adieu and Other Stories. Extended footnotes welcome! I am in the middle of watching the first episode, and while there is a pretty big handful of "you are watching a British period piece" involved, it's pretty good so far! Childermass is entirely incorrectly cast though. The Ladies of Grace Adieu is one of my favorite stories, ever, although the rest of that book is wonderful as well. This is BBC-only (the regular UK one) right now, right? I couldn't see anywhere else it was available in the US before June 13. Yes, this is on the BBC One timeline. In the talk post for this show earlier, nearly everyone when asked preferred a post now rather than when it aired in North America. I wish there had been more budget for the York Minster setpiece. Although they actually did shoot in York Minster, so I guess I can't fault them for that. Is this what BBC period pieces are like now, with all the wide-angle tracking dolly shots? It made me kind of seasick tbh. Paul Kaye's Vinculus was a near-perfect mix of foreboding and slapstick. Dude who played Lascelles is PERFECT. 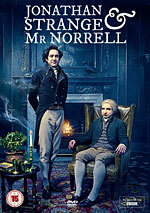 Eddie Marsan's Norrell seemed a bit more worldly than I expected from the novel, and more calculating than the novel's Norrell seemed to me. Childermass comes off as more of a sinister Svengali than a servant who made good, at least until his encounter with Vinculus. Bertie Carvel looks like he's having fun, which is pretty much how I think of Jonathan Strange. Everyone else needs some more character moments before I can really render judgment. Oh yes, and I'm still concerned that the feminist aspects of the books might be dreadfully reduced or jettisoned altogether. All right, we went ahead and watched it. Good casting; entertaining physicality in terms of the acting. Not really sure the things I liked about the novel are translating very well, but we'll see. Having finished - It's OK - I liked Vinculus, Childermass is too pretty, the man with the thistledown hair looks like Bowie from Labyrinth. I want to see the ships made of rain from the war effort part before I pass judgement because the Yorkminster CGI was less than wonderful. I'm a little wary about the thought of condensing this story down, but this first episode was enjoyable enough that I'll definitely keep watching. Hmm. I liked it, but I didn't like Marc Warren's The Gentleman (that portrayal was very Gormeghast-y to me, the uncomplicated soups). I don't remember much of the book at all, so I don't know how close that was hewing to the text, but I just find him boring. The missing-finger CGI didn't do anything for me, either. It looked too clean, I guess. I laughed more than I thought I would, though! This is probably my favorite book. My favorite parts of the book are literally untranslatable into film. Namely, to paraphrase a facebook comment I made in the wayback times of a few months ago, it is a book with a strong thematic element being the power of books written in the style of several books of the period with a story driven by fictional books where one of the central MacGuffins is a book. The bookishness of this book is absolute: That is probably a strong source of my love for the novel. So, I came into this hoping for a good adaptation of the also-very-good plot and characters. So far, I'm not disappointed. Drawlight and Viniculus are both suitably repellent in their own ways. The Gentleman looks ridiculous in both coiffure and costume. I'm not a fan of the Wobbly-Echoy Voice of Power, either. I also didn't find him particularly menacing. I just finished watching it, and it was decent enough - reserving judgement for a few more episodes. I love the book SO much (it and the The Ladies of Grace Adieu and Other Stories have survived many physical book purges in the last decade) and it does feel like they did a pretty good job of it (loved Vinculus in particular). Sadly, the exception was the Gentleman with Thistledown Hair, who I did not like at all. Like abs, I didn't like the "Wobbly-Echo-y Voice of Power" thing, and the whole look was way too BBC-period-drama-ish for me. And not scary like I remember him. Maybe he'll grow on me. I hope. I figured that the gentleman would be older and with wilder hair. Like uncomplicated soups said, he looked too much like David Bowie, and quite shook me out of the viewing. The lady pole resurrection from the book felt very eerie/scary, and here, it hardly had the same effect. It's weird how many lines from the book I remember. The Gentleman's hair is just wrong. Wrong like a wrong thing. And my mental image of Lady Pole was of a blonde, for some reason. But I liked Arabella, what we saw of her, and I'm glad they kept Henry in the picture, just for family context. Really, I liked what I saw, mostly, and it seems very true to the book. But the book ends up very subversive in that the subalterns are the ones who bring magic back, really -- Vinculus, Childermass, Stephen, Arabella -- and I want more attention paid to them by the filming techniques, if not explicitly by the dialog. If that makes sense. What do you mean by the references to Gormenghast? I did see the BBC adaptation but that was... wow... 15 years ago and don't remember much beyond a vague feeling that I enjoyed it, and perhaps that Swelter was suitably disgusting. I pictured the Gentleman With The Thistle-Down Hair as looking like David Bowie, but not that version of David Bowie. Less big hair, more fine features and mismatch between size and presence. I had absolutely no idea this was a thing. I'm looking forward to DVRing it and catching up. The Gentleman is too ridiculous, but other than that I loved everything about it. I read the book long enough ago that I don't remember my own images of what the characters look like. I'm going to no doubt start rereading it before the series is done though. My favorite part was at the party when they complain that the party is so boring "this gentleman is reading a book!". Also, every time they use the phrase 'the man under the hedge'. Oh and the sticks!! I kind of expected Jonathan to be a bit annoying but now I think I could watch an entire show of just him wandering around acting ridiculous. I enjoyed this. I find Norrell more sympathetic in the show than in the books, and Jonathan Strange is miscast. (Also, was he ever friends with Henry? I don't remember that.) I'm not sure yet about Childermass, though they're being somewhat more overt about his ability to do magic. The statues piece was terrible -- why say "he brought them to life!" We can SEE that. The Gentleman's hair was, I agree, far too neat. I expected it to poke out more. I don't mind that he wasn't scary; he gets more frightening with time. I'm glad Drawlight and Lascelles are cast so physically distinct because I can never keep them apart in my head. I wish we'd seen more of Honeyfoot and Segundus. I found it enjoyable, but I thought that there was something of the spirit of the book that was missing. Maybe it's just the inherent bookishness that absalom mentions, which can't be translated to the screen. But I think part of it is that they didn't totally play it straight as a historical drama. For example, the Learned Society of York Magicians (aside from Segundus and Honeyfoot) are played as cartoonish buffoons. Vinculus and Drawlight also suffer from a bit of overacting, as does the Gentleman with Thistledown Hair (though maybe for him it's appropriate). I would have preferred to see something that could easily have passed for a BBC costume drama, aside from the magic parts of it. Norrell, on the other hand, I think was close to how he should have been. As for Strange, I'm not sure yet how I feel about him, since he hasn't spent much time on screen so far. And, yes, the Gentleman's hair was not very thistledowny. I've loved Marc Warren in other productions, and I have faith that he can bring the crazy in future episodes, but, yeah, his hair is way too perfect. I think David Bowie in Labyrinth looked much better than The Gentleman. To me, the Gentleman looks like Jack Frost as played by Martin Short, except with worse make-up. And his voice is not as I imagined at all. I enjoyed the first episode otherwise, though. Thoros of Myr as Vinculus is great casting. Looking forward to the rest of the series, now that it is finally being released in the US.